The northern reaches of Queensland’s Hervey Bay, and the even more remote waters east of Fraser Island’s northern tip seldom see much ﬁshing pressure. Although these grounds are revered as fish rich hotspots for a multitude of pelagic and reef species, their remoteness keeps their full potential still somewhat undiscovered. For many years the northern end of Hervey Bay has been renowned for producing an extraordinary run of baby black marlin over the shallow inside grounds during late winter and spring. In recent years, the offshore waters have also gained a reputation for their exceptional numbers of blue and striped marlin during spring and early summer. This heavy-tackle ﬁshery has lured Gold Coast gameboat Mistress to spend several months running liveaboard charters to these remote grounds. This year they were there in June and discovered a surprising number of tiny black marlin in the bay, catching some as small as 2kg and seeing others so small they proved difﬁcult to hook. The discovery of these baby black marlin at that time of year is remarkable because it does not match with the timing of the species’ currently—known spawning off Cairns. Considering the phenomenally fast growth rate of black marlin, the marlin caught by Mistress in Hervey Bay during June would have been only two to three months old, whereas fish spawned off Cairns in October/November would be far larger. 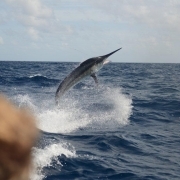 This has led Dr Julian Pepperell to suspect that another black marlin breeding ground must be located much closer to Fraser Island than Cairns, with a separate spawning event occurring in perhaps February or March. Dr Pepperell has requested anglers catching these tiny black marlin to keep and freeze the heads of a couple of specimens so that their otoliths (ear bones) can be extracted and examined to more precisely determine their age. This will help lead to the discovery of their other breeding ground, and that will have huge ramiﬁcations for anglers wanting to find the giant parents. 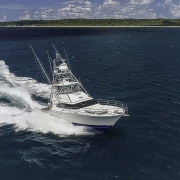 The recently recognised world-class marlin fishing ground off the continental shelf from Hervey Bay could become a mecca for game fishers around the globe, according to an industry specialist. Barry Alty, the Gold Coast-based owner of game fishing charter boat Mistress, said the fishing ground off Fraser Island was one of the most prolific in the world. He said last year they recorded an average catch rate of more than two marlin a day, a feat that could not be achieved anywhere else in the world over such a prolonged period. “It could be one of the best and biggest blue marlin fisheries in the world,” Mr Alty said. He said it had long been known there were good numbers of juvenile black marlin up to a year old near Fraser Island but because of boat sizes and distances, there had only been a modest fishing effort on the edge of the continental shelf. “The more we learn about the grounds, the more we’ll catch,” Mr Alty said. 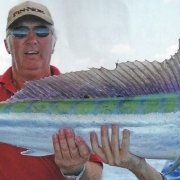 He said because of the variety of marlin in the region, another lure for anglers was the chance of a ‘slam’ – catching three different species in one day. and release marlin on the Fraser Coast and Mr Alty said it was a tremendous tourism opportunity for Hervey Bay. “Game fishers travel the world to fish in the best or different locations,” he said. Mr Alty said anglers spent between $2500 and $3500 a day to charter a game fishing boat and it would be for a minimum of three days on the Fraser Coast due to the distance to the fishing ground, which was about 120km from Urangan and 40km east of Fraser Island. He said many fishers also brought their partners who stayed in local accommodation and visited tourism attractions in the region. “Regardless of where people come from, they will normally stay longer than the period they are chartering for, particularly if from overseas,” Mr Alty said. Last year, the biggest blue marlin caught from Mistress weighed an estimated 7001b, or almost 320kg. Mr Alty said Hervey Bay had similar potential as Kona in Hawaii where the development of the marlin fishery led to an explosion in the number of hotels, restaurants, apartments and charter fishing boats. “I believe Hervey Bay could establish a major tourist industry from game fishing and bring considerable income to the area,” he said. Mr Alty said there was also a possibility of the Fraser Coast establishing a giant black marlin season. He said some black marlin as small as 2kg had been caught, which was significant because it meant they were probably only two to three months old, so it was likely there was a spawning ground near Fraser Island. It may well lead to another giant black marlin season outside the traditional September to November Cairns breeding period,” Mr Alty said. The Hervey Bay Game Fishing Club recently hosted the biggest game fishing competition in Queensland from November 15 to 18. HBGFC president Brad Rocke said 41 boats and 155 anglers competed in the 20th annual Game Fishing Classic, tagging 51 marlin. He said the tournament attracted boats from as far away as southern NSW, Cairns charter companies and anglers from New Zealand and Western Australia. “Mistress” had a very successful 2017/2018 fishing year which ended on 30June 2018. All up we fished 92 days on the grounds we pioneered and “discovered” off Fraser Island and Tagged and Released or Released a Total of 199 Marlin. Incidently on 30 June when we were hoping to break the 200 figure we went one from 5. Rubber Hooks just when we didn’t need it? Such is Fishing. Highest Point Scoring Boat For Marlin. 2nd. David Litchfield Trophy. Sir Garrick Agnew Trophy for Angler who tagged the Most Billfish: Barry Alty. NSW DPI FISHERIES DEPT (Who run the Australian tagging program and count all tags whereas the GFAA only counts fish tagged by Affiliated Club Members. Trophy for most Billfish Tagged: 2nd. Trophy for Captain Tagging Most Blue Marlin: Captain Brett Alty. Trophy for Angler Tagging Most Blue Marlin: Barry Alty. Trophy for Captain Releasing the most Black Marlin in the Pacific Ocean: Captain Brett Alty. Trophy for Angler Releasing the most Black Marlin in the Pacific Ocean: Barry Alty. All in all a very successful year for “Mistress” her crew, and Anglers. As was reported earlier in In The Bite E-News “Mistress” enjoyed outstanding success at Fraser last year Tagging 104 in just 42 days during the period late August to late Nov. “Mistress” fished on to early December before returning to the Gold Coast for some much needed maintenence. 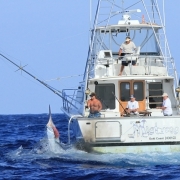 All up in the Aug/ Dec period “Mistress” fished 48 days for 128 Tagged Marlin. An astounding average of 2.7 fish per boat day! We were on our lonesome for the entire period August to October, but in November we had 3 Motherships and 10 Gameboats sharing the most commonly used anchorage; that at Rooneys Point.Among them the Gold Coast boats Caboom, Special K, and French Look 111, plus the charter boat Kekoa.Word of the outstanding fishing had spread quickly? In late February “Mistress’ returned to Fraser and fished another 44 days. During this period currents weren’t ideal and weather patterns meant that most fishing was done around the New Moon which we don’t find the best Moon Phase; rather the week before and after the Full seems preferable. Nevertheless “Mistress” managed another 71 Tags to bring the total for the year ended 30 June to 199. This was a little disappointing as we were hoping for a nice round and memorable number –like 200. However on the last day of the fishing year we developed the dreaded “Rubber Hook “syndrome and went one from 5 for the day. Damn. The 199 Marlin Tagged comprised 150 Blue Marlin, 30 Little Blacks and 19 assorted Heavy Tackle Blacks and Stripes. That’s World class fishing by any measure. There are some interesting aspects to the fishery at Fraser. The Blues and Stripes strike very aggressively. With the Strikes there was none of the usual Tap—Tap— Tap. They just climbed on like a Blue. All the fish were in excellent condition. They were all fat. Much more so than the ones we see on the Gold Coast only a couple of hundred miles south. There were also Yellowfin Tuna present ranging from a few kilos to up to 75kg out on the Shelf. On one occasion there were so many Yellowfin around that they were beating the Blues to the Lures. Captain Brett could see Blues coming up in the Lure pattern, but they were being consistently beaten to the Lures by frenzied Yellowfin.In June?July we also tagged, and quite predictably lost quite a few tiny Little Blacks. Some vainly trying, but failing to hook themselves on Lures were as small as 2kg! We reported this to Julian Pepperall who was intrigued because he thought that fish of this size were probably only 2 to 3 months old. If this is the case it means that they were most likely spawned about February or March. This has quite serious ramifications as it means that there is a Black Marlin spawning period outside the traditional September to November Cairns breeding period. Julian requested that we keep a couple of the Heads off these tiny Blacks so that he can inspect the oeliths and more precisely determine their age. If Julian’s initial prognosis is correct it may well lead to another Giant Black Marlin season, most likely some where near Fraser Island. No doubt when we get confirmation of Julian’s estimate we and other long range liveaboard boats will out in the wild blue yonder doing some exploratory fishing trying to find this new breeding ground. “Mistress” started its latest session at Fraser with a 3 day 3hr fishing trip initially fishing for Little Blacks and Tagged 8 up to the morning of the 3rd day then decided to go Heavy Tackle seeking a Slam. Well the Lady angler, one of the three on board caught her first Blue and then was unlucky to pull the hooks out of a Stripe. On his second trip Captain Brett decided to fish Heavy Tackle for 4 days and wound up with an absolutely outstanding 23 Tags from 32 Strikes. All Blues. That’s 5.75 Blues per day. Fingers crossed this keeps up !! On the fourth day Captain Brett actually moved away from his spot and called a couple of his friends in. His sole Charterer was worn out from fighting so many fish, and his two Deckies were worn out from constant work rerigging/ resetting Lures and leadering fish.Hows that for a problem. Now “Mistress” has done a total of 11 days and 3 hrs at Fraser since the end of September and has Tagged 42 Marlin comprising 33 Blues, 8 Blacks, and 1 Striped. That’s an astonishing average of 3.72 per day of fishing. At the moment there are around 6 boats fishing at Fraser among them Brad Dobinsons “Special K” and Captain Simon Carossi driving “Assegai”. Simon also has his Mothership there. I imagine that once again there will be a fleet descend on Fraser in November. Some of the Cairns Charter Boats have announced their intention to come down, and there will also be boats from both north and south making an extended visit around their Hervey Bay Gamefish Club Tournament attendance ( Tourny 16th to 19th Nov).